(4 August 2018 / Palma de Mallorca, Spain) - After eleven races, Alessandro Rombelli's STIG with Francesco Bruni as tactician, and crew members Daniele Fiaschi, Luca Faravelli, Iztok Knafelc, Pietro Mantovani, Pierluigi De Felice, and Giorgio, and Martino Tortarolo are 2018 Copa del Rey Mapfre Champions! Rombelli started the day five points ahead of Yukihiro Ishida's SIKON (Manu Weiller, tactician), and as he has managed in the past, he successfully found the right edge to keep his team in the lead to take the win, despite the aggressive attacks from his best opponents. "This regatta is one of the most prestigious to win in the Mediterranean, and an event I have sailed before. But, to win in my Melges 40 has special meaning," said Rombelli. " We wanted to do well here in Palma because it was an important race that could put us back in a good position on the 2018 ranking. We are very excited about the final event on the circuit, and the possibility of defending our title." 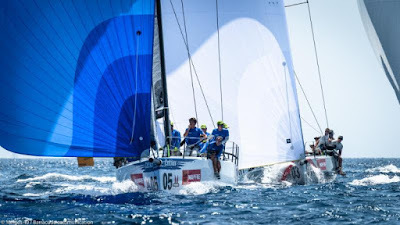 The last day of Copa del Rey Mapfre, hosted by Real Club Nautico de Palma commenced with Ishida winning Race Ten keeping all hopes alive that the winner could still be decided on the final race. Rombelli came a close second, followed by Andrea Lacorte's VITAMINA-CETILAR (Alberto Bolzan, tactician) in third. Race Eleven saw the bow of Valentin Zavadnikov's DYNAMIQ-SYNERGY SAILING TEAM (Kelvin Harrap, tactician) across the finish line in first to complete the event. Rombelli clinched the Copa del Rey Mapfre title by taking second place. Finishing in third was Richard Goransson's INGA, who up until now had dominated every Melges 40 event this season. "I am very proud of the team as they did a great job in winning this regatta, something we were after since Day 1," said Bruni. "All of the racing was held under similar conditions in terms of wind direction and intensity, but it was important for us to win. We look to the next event with confidence, however it will be intense as we will be playing for everything."